Topics: Introducers, Vfiles, Factoring, and Invoice Discounting. 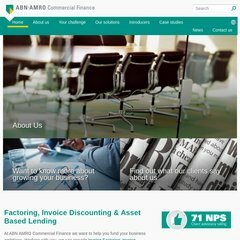 abnamrocommercialfinan.. Factoring | Invoice Finance | Small Business Funding | ABN AMRO ..
abnamrocommercialfinan.. Small Business Invoice Financing | Working Capital Finance | ABN ..
abnamrocommercialfinan.. ABN AMRO Commercial Finance | Vfiles - Factoring | Invoice Finance .. The site has about 187 users daily, viewing on average 3.00 pages each. It is hosted by Abn Amro Commercial Finance (Northern Ireland, Carr,) using Microsoft-IIS/6 web server. It is written for ASP.NET language. ns1.je-eigen-domein.nl, ns2.je-eigen-domein.nl, and ns3.je-eigen-domein.nl are some of its 4 Nameservers.